The Equinox Trio specialises in 20th century and contemporary music. The Equinox Trio, which specialises in 20th century and contemporary music, presented a concert entitled ‘Summer tones’ as part of Evenings on Campus on July 29. The soirée featured music by young Maltese composers Veronique Vella and Ruben Zahra and Aram Khachaturian and Edward Manukyan, from Armenia. But while Khachaturian lived, worked and died in the Soviet Union of which Armenia was part, Manukyan, who was born in Armenia in 1981, moved to the US in 2002 where in 2007 he obtained a Master of Music degree, where his compositions are very much in demand. The Equinox Trio comprisesTricia Dawn Williams (piano),Tatjana Chircop (violin) and Lino Pirotta (clarinet). In the Trio for Clarinet, Violin and Piano ,composed by Khachaturian in 1932, the three instruments shared the weight of the work equally, each playing and developing the theme first given to the clarinet, played convincingly by Lino Pirotta. He also played the folk tune which dominated the second movement, but not before the violin, another high-pitched instrument, had established its importance. The pianist, Williams, was her usual assertive self and gave her full contribution to the work which ended beautifully on a very soft note. Then came Vella’s composition Fjuri. Vella has developed her compositional skills in leaps and bounds. The work (2008) is in three movements, named after three different flowers but inspired by Maltese children’s rhymes. These, however, became less recognisable as they developed. The lowly geranium, grown in most Maltese homes, was delightfully introduced, free, nimble and playfully in Sardinella, the first movement. Next came Passju (hopscotch), an outdoor children’s game. Just like every player had to wait their turn in the game, the three instruments took it in turns to be played. The slow waltz introduced in the opening of this movement returned at its end. The three musicians proved their worth especially in the last movement, Peprina (poppy), lithe, happy and spirited at its opening by the piano and violin. The work ended brilliantly, proving the empathy that exists between the three musicians who work as one. 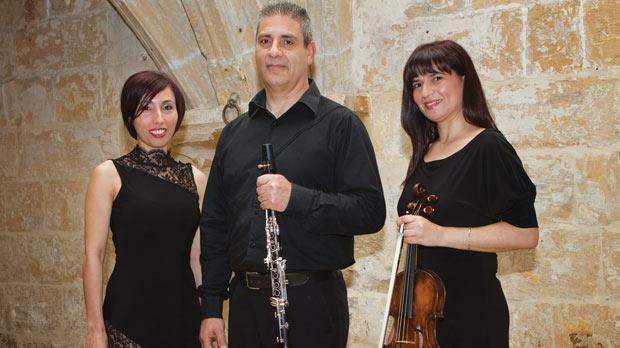 After this Maltese soundscape, we were back to Armenia with the trio for Clarinet, Violin and Piano by Manukyan, a three-movement work filled with the spirit of Armenian folksongs which are given a modern setting. It began with a hauntingly beautiful melody, incredibly awe-inspiring which gave the three musicians every opportunity to show their mettle. The first movement called Homeland From Far Away was opened by a plaintive melody leading to a violin cadenza. The second movement, Across the Rocky Mountains, is a slow, meditative work with a beautiful clarinet cadenza while Dance is the lively last movement with a slow, lyrical middle section featuring the clarinet. The piano had some heavy note-clusters to perform while the whole work instilled a lovely atmosphere created by luscious folk melodies. An extremely beautiful work. For the last item, we were back in Malta (or should I say the Mediterranean?) with Pan, the Goat God by Zahra. This four-movement work is based on strong rhythms defining this rustic god of the wild with hindquarters, legs and horns of a goat, worshipped in Arcadia, the main seat of his worship. His ungainly walk, the dance of the Nymphs and his erratic course among boulders and rocks all feature in this work. The evening came to an end with Pirotta’s lovely arrangement for the trio of Astor Piazzolla’s Oblivion .